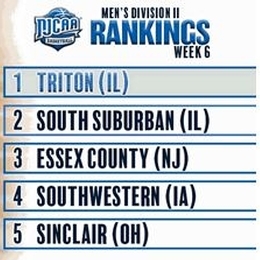 For the week beginning December 5, the undefeated Sinclair Men’s Basketball team moves up to #5 in the first NJCAA Division II Basketball Poll. The Pride entered the season ranked 13th in the Pre-Season Polls and has pushed through the first 9 games without a loss. Coming off a 28-3 conference championship run last season and graduating 7 sophomores, this year was expected to be somewhat of a rebuilding campaign. Problem is, someone forgot to tell the 10 new members of currently 9-0 Pride. With the home win on November 30, this group of sophomores have not lost a college game during their two years in the month of November. The 71-68 win on Saturday at Wayne County also set a new school record with 13 straight non-conference road wins. Last year Sinclair spent most of the season ranked in the Top 20 with a short stint at #2 for a couple of weeks after the record setting start of 21-0. This season, the Pride is honored to receive this ranking with some many new players. Leading the way with 8 double-doubles already this season, Tri-Captain and the only returning starter, Akiean Frederick (6-9/SO – Franklin Heights H.S.). The 6-9 Forward has already received major interest from a number of NCAA Division I coaches and countless Division II all before the Christmas break. As the preseason coaches pick to repeat as OCCAC Champion, Sinclair will open conference play this Saturday as the Pride host Lakeland at 3pm in the only arena in the nation named Building 8. This will be the first of three straight home conference games heading into break.